I recently realized that I have this blog for five years already. More precisely, on March 31 2008, I did my first post here. It was my project lead at that moment that encouraged me to write down some stuff I had done with jBPM. He is now a real good friend of mine, and it is funny to look back how different things where five years ago. In that same period of time I got a house, got married, two kids, a dog, was hired by JBoss to work on jBPM and later joined Alfresco to build Activiti. I remember that my first posts on this blog caused quite a stir in the company I was working back then. Something about ‘company secrets’ or something. Yeah, it was five years ago, I told you. It’s good to see they changed their attitude towards blogging if I see my ex-colleagues freely blogging now. Over the past five years, my blog grew really nicely. Below you can see an overview of the unique visitors / month. There’s a jump in June 2009, when I joined JBoss. For a long time, I’ve been floating around a steady 5K line but the last months traffic is sure on the rise as shown by the slope on the right (8850 unique visits last month). It really amazes me that a simple blog like this can attract this amount of people. Really humbling. As such, it really motivates me to continue posting on what I’m working on from day to day. In those five years, I wrote 115 posts (that’s 23 posts on average each year), 223.211 people have visited this blog, of which 128.222 unique visitors. If you think about that number of people … that’ just amazing. That are more people than the amount of inhabitants of Bruges, one of the more famous cities in Belgium. But more importantly, over those five years the average time on the blog is 2:21 minutes. So people really take their time to write down what I write! In the age of twitter that means a lot. 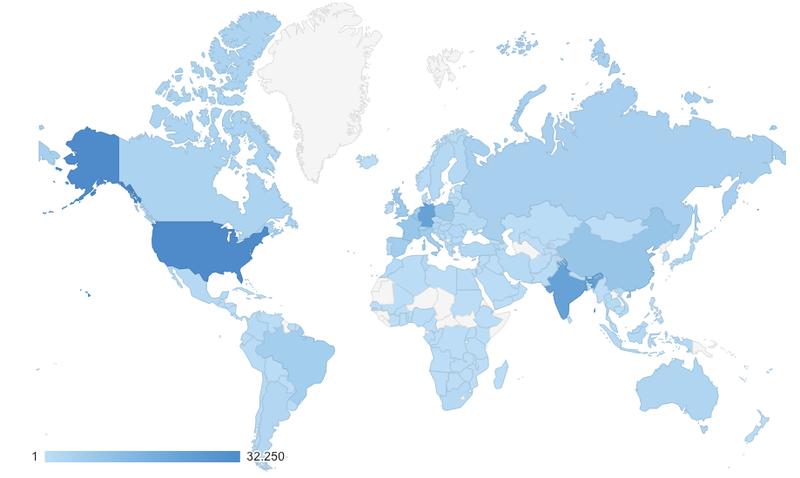 The image below shows where all the visits are coming from. The top 3 is no surprise, as it is where we also see most requests from in the Activiti community. I can say nothing more than that I’m really humbled that you all take the time to read what I write down here. Thank you. Thank all of the 128.222 of you!